We came across this article on reliefweb, that gives a good summary of the damage. On Thursday, 29 November at 15:00 hrs (13:00 hrs local Caribbean time) an earthquake of magnitude 7.4 (National Earthquake Information Center http://earthquake.usgs.gov/regional/neic/) occurred near the island of Martinique – Windward Islands in the Caribbean. The epicentre was located at 14.921°N, 61.264°W. (21 km east of Martinique) at a depth of 145.4 km (90.4 miles). Tremors of varying time lengths and magnitude were felt in other Caribbean islands – Dominica, St. Lucia, Barbados and Trinidad and Tobago. Mobile phone services have been interrupted in many cases, and the tremor was felt hundreds of miles away in Guyana, on continental South America. However, as the depth of the event is considerable, the impact on the surface has been moderate. In Martinique there have been reports of rocks fallen on roads and panic in supermarkets as products fell from shelves. The Prefecture scheduled a meeting to revise and evaluate the damages. In St. Lucia there was some damage to the water lines, though no major damages reported. Some damages in the water lines. There was temporary disruption of cell phone service in Dominica, but there have been no reports of injury or damage to buildings. One injury was reported in Barbados when a person stumbled down the stairs during evacuation of a building. One house destroyed in Ellerton, St. George and some land-slides reported. Earthquake Update: Reports of one fatality in Guadeloupe. 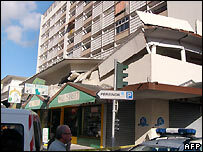 Reports are coming in of a 3 year old girl being killed in Guadeloupe due to a falling wall. Also there are reports of widespread property damage. A strong earthquake measuring 6.3 on the Richter scale has killed a three-year-old girl, injured numerous people and caused widespread damage in Guadeloupe. The fire and rescue service says the girl was crushed by a collapsed wall in Trois-Rivieres on the island Basse-Terre and died on her way to hospital, while her seven-year-old sister was in critical condition. There were also numerous injuries and widespread property damage on Terre-de-Bas, one of the Saints islands, that are located just south of Basse-Terre, the French overseas department’s main island. The quake struck at 11:50 GMT with the seismological institutes in Guadeloupe and continental France putting its epicentre south of the Saints islands towards neighbouring Dominica, numerous aftershocks were recorded. Most of Terre-de-Basse’s 1,300 inhabitants had gathered on the field of the island’s only stadium. “People whose homes are intact don’t want to go back to them and we are going to have to set up a tent village,” a fire and rescue service officer said. Many homes and public buildings suffered damage, with the church partially collapsing.